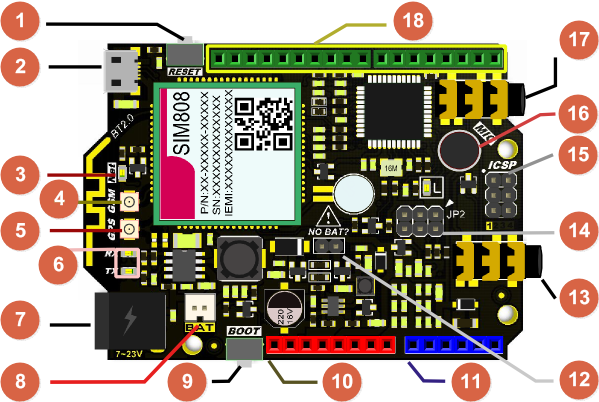 SIM808 with Leonardo mainboard is the latest Arduino card developed for multi-purpose by DFRobot. The SIM808 module onboard is an integrated quad-band GSM/GPRS and GPS satellite navigation technology module. 4-layer PCB design makes the powerful card into an UNO size, this can saves time and cost for you. This SIM808 we chosen is the latest version, compared with the existing SIM808 module on the market, the new module has a better stability. However, you may have to pay attention that the AT command of the GPS is not compatible with the old version of the SIM808 module. Applications: GPRS network nodes, remote communications, GPS positioning and monitoring in real time, the Internet of things(IoT). If you attached a 3.7V Li-Battery as power supply, remember to remove the Jumper from NO-BAT (Num.12) or it will reduce the battery's life. Even USB connection, please remove the jumper cap. If you don't connect USB port or VIN power supply, make sure the jumper connected. Arduino D12 pin has been connected to the module power switch. You can set the pin HIGH/LOW to turn the SIM808 module ON/OFF in code. The D12 pin will become inactive if the board is powered through a VIN pin by a 7-23V DC power supply, and SIM808 will auto startup in this case. The MIC jack shares the same traces as the onboard MIC, so if you insert an external microphone, MIC (16) will become inactive. DTR - Data terminal ready. The user can control the SIM808 module to enter or exit sleep mode(AT+CSCLK=1) by DTR signal or by pulling down the DTR pin. The serial port will become active after the DTR pin is pulled to LOW for 50ms. SMS The pin is changed to LOW, and kept low for 120ms when a SMS is received. Then it is changed to HIGH. 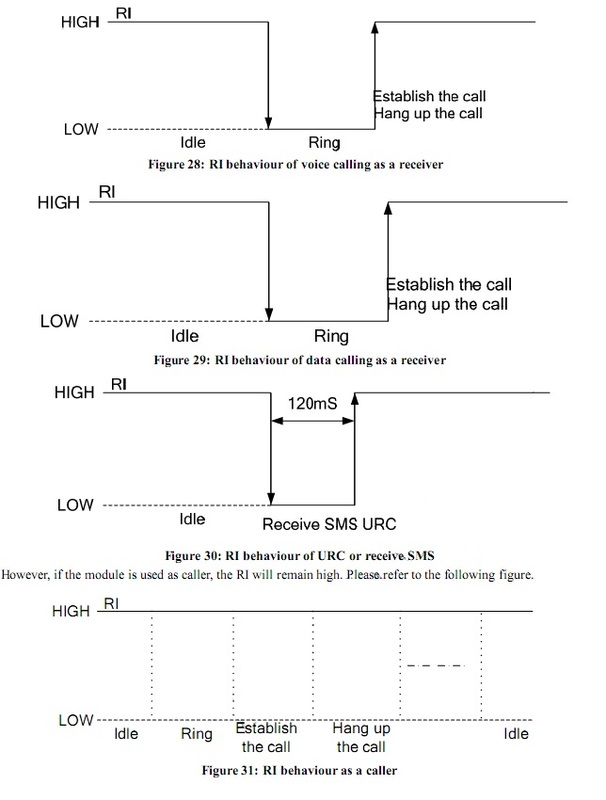 URC The pin is changed to LOW, and kept low for 120ms when some URCs are reported. Then it is changed to HIGH. For more details, please refer to SIM808_Hardware Design_V1.00. 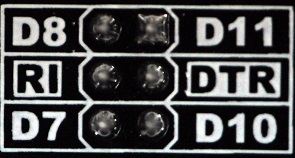 The user can control the SIM808 module to enter or exit sleep mode (AT+CSCLK=1) by DTR signal. 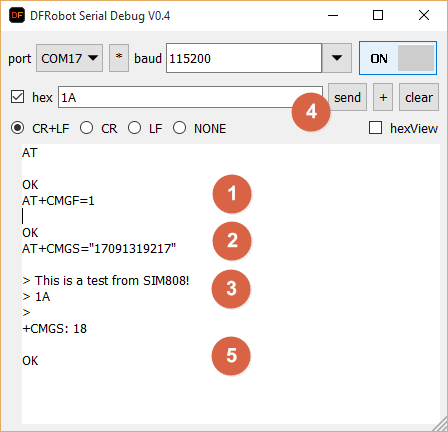 When DTR is high level and without interrupt (on air and hardware such as GPIO interrupt or data in serial port), SIM808 will enter sleep mode automatically. 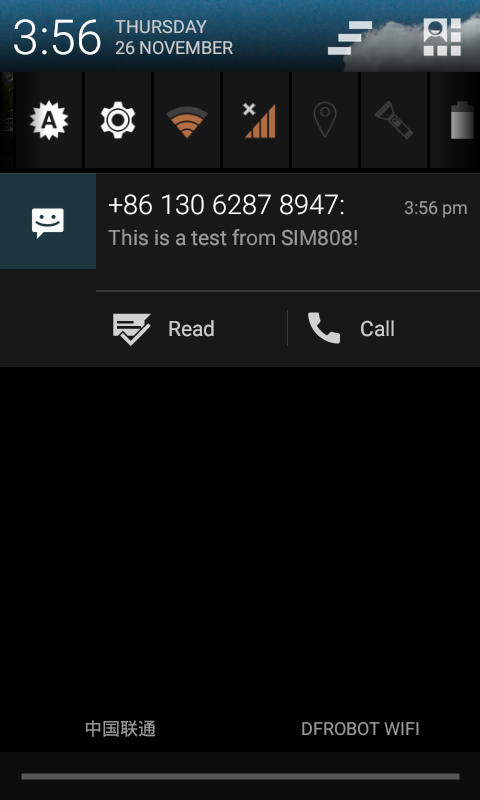 In this mode, SIM808 can still receive paging or SMS messages from the network but the serial port is not accessible. NOTE: The user must shut off the power supply of GPS, and then the AT commands about the power saving mode can be executed correctly, and current consumption will be lower. There are three functionality modes, which are set by the AT command AT+CFUN=\. The command provides the choice of the functionality levels \=0, 1, 4. Minimum functionality mode minimizes the current consumption to the lowest level. 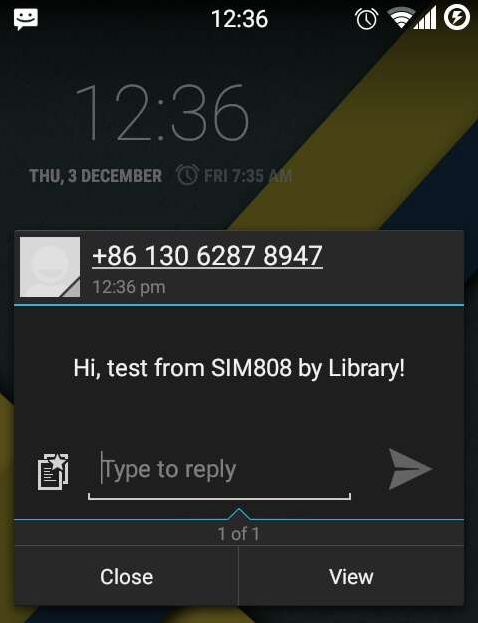 If SIM808 is set to minimum functionality by AT+CFUN=0, the RF function and SIM card function will be disabled. 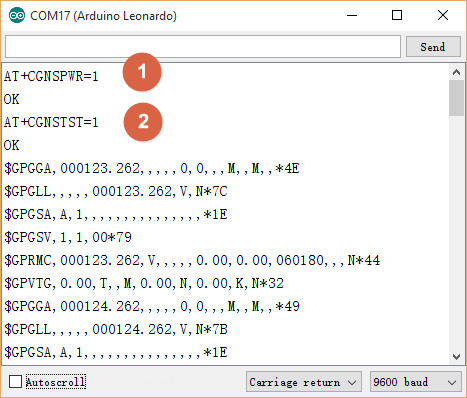 In this case, the serial port is still accessible, but all AT commands correlated with RF function and SIM card function will not be accessible. When the GPS function is shut off, the user can control SIM808 module to enter or exit the sleep mode (AT+CSCLK=1) by DTR signal. 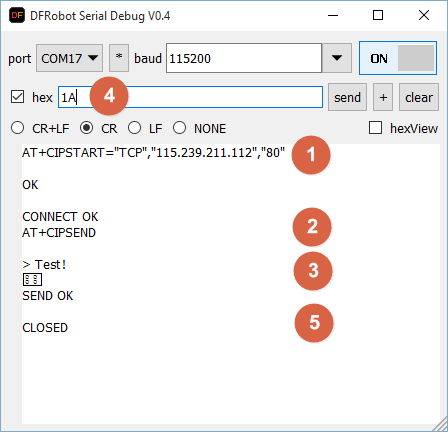 When DTR is in high level and without interrupt (on air and hardware such as GPIO interrupt or data in serial port), SIM808 will enter sleep mode automatically. 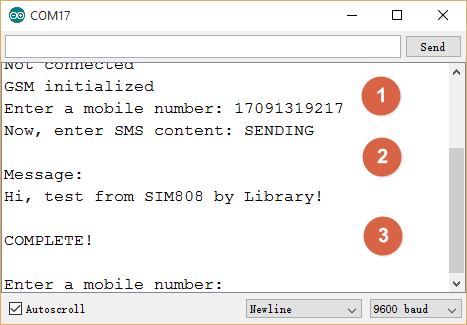 In this mode, SIM808 can still receive paging or SMS messages from the network, but the serial port is not accessible. NOTE: For SIM808, it requests to set AT command: AT+CSCLK=1 and ensure DTR at high level to enable the sleep mode; the default value is 0, which can not make the module to enter sleep mode. Pull down the DTR pin. 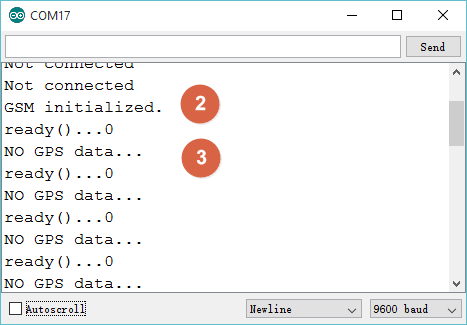 The serial port will become active after the DTR pin is pulled to low level for 50ms. Remove the jumper Cap from "NO BAT?" Connect an external DC power supply 7-23V to VIN power interface. If it fails to register, disconnect and reinsert it. After the five steps above, you can query the battery and charging status by sending AT+CBC. For more details please refer to the AT instruction manual (Bottom of this page > "More"). In this section we will do some basic tasks on the board via AT commands. More AT command can be found at the end of the page @ More> Document> AT commands. 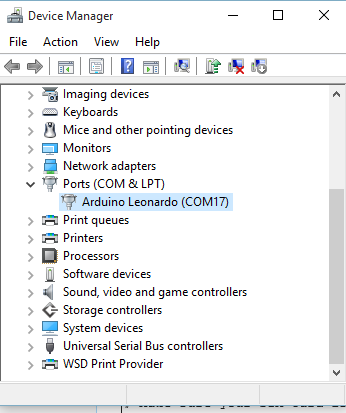 Note: SIM808 mainboard is using Arduino Leonardo. This microcontroller has two serial ports. 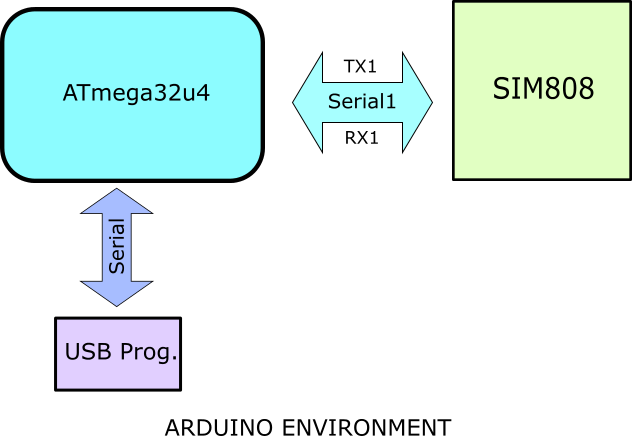 Serial0 (Serial) is used to communicated with USB port; Serial1 is used to communicated with SIM808 GSM module. 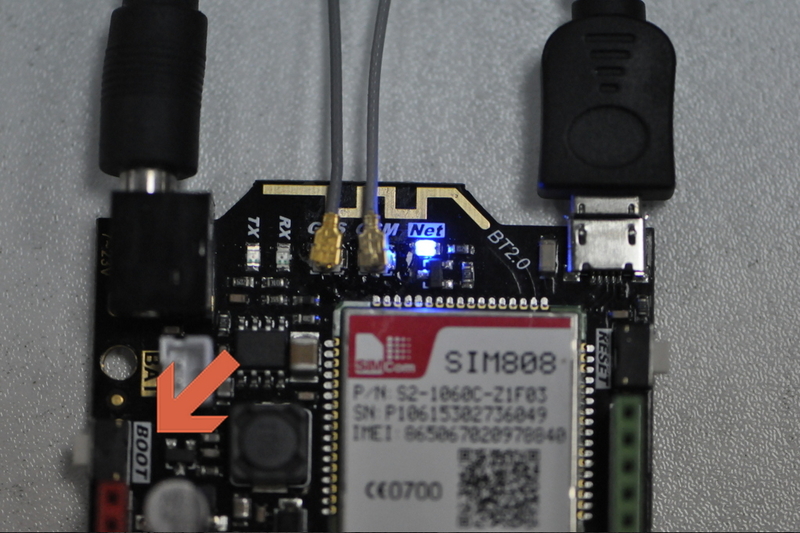 * data between the USB serial port and SIM808 module. Micro USB Cablex1 Coolterm or DF Serial Debugger by Lisper, we use the second one in the wiki. Make sure your SIM card is available, and you can put the SIM card into the socket or get it out by sliding the metal lock. BOOT SIM808 by pressing the BOOT white button for 2 seconds if the NET indicator LED is OFF. 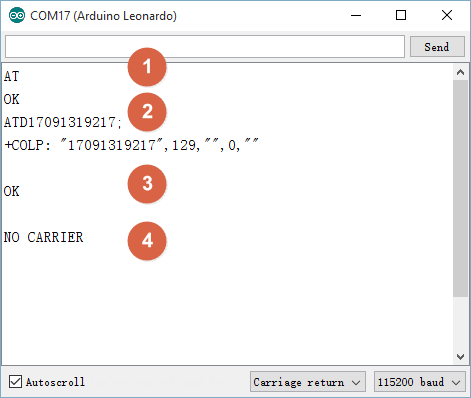 Upload the Debugging Code above to Leonardo. 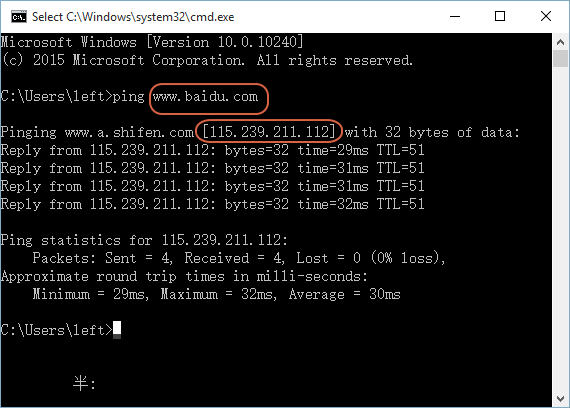 Press Windows+r, type cmd, click OK.
After a while, the connection with the site will break off automatically if no more data is transmitted. You can also send AT+CIPCLOSE to break the connection. We recommend using this feature outside for best perfomance. 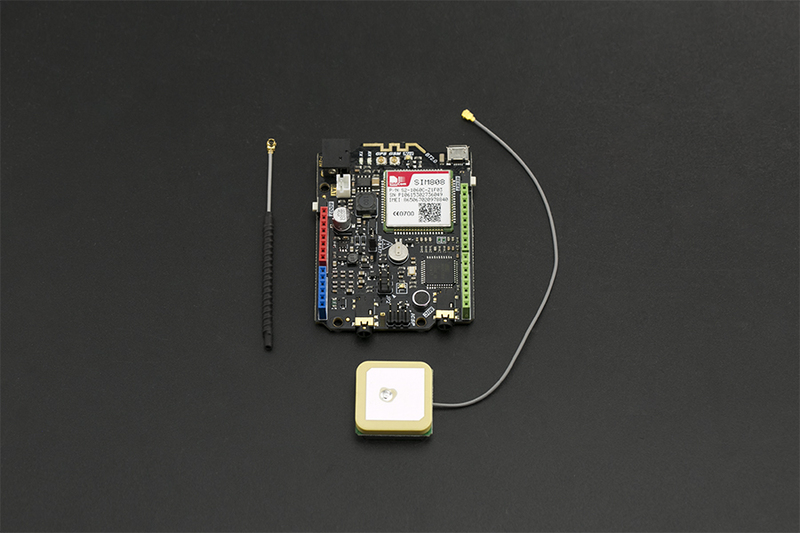 The module should then start displaying GPS location data. NOTE: To get GPS position data, the module should be placed outside. Here, we did the it inside in order to demonstrate the AT commands. Read: The raw GPS data from the serial is in the form: DDmm.mmmmm. e.g. If the raw information is: 5320.12345, then it is: 53 degress and 20.12345 minutes. In order to convert to decimal coordinates you need to divide the minutes by 60. i.e. 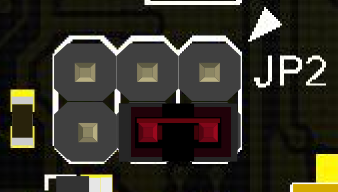 20.12345/60 = 0.33539. So the decimal result is 53.33539. Forum reading, attached source code that prints google maps friendly coordinates for SIM908 module. 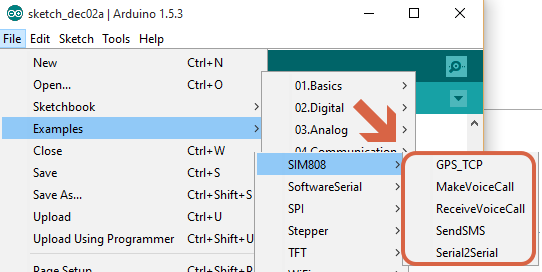 Download the SIM808 library and install it to Arduino-1.5. *\libraries instead of Documents\Arduino\Library! 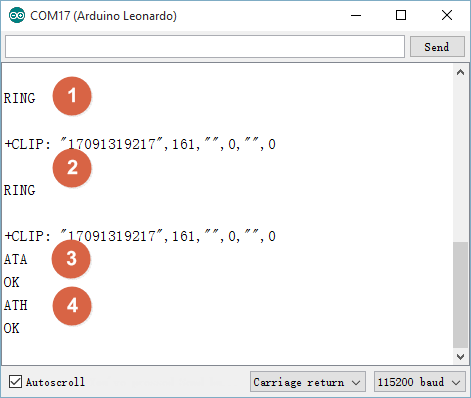 The library should be placed at Arduino1.5. 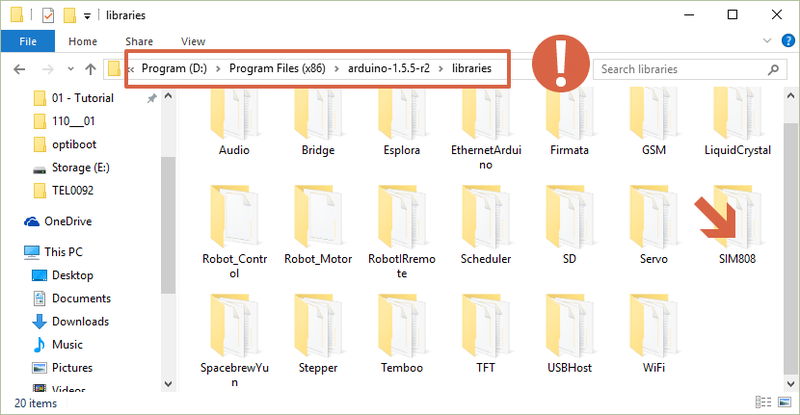 *\libraries, the Arduino Installation directory. Open Arduino V1.5. *, and you will find the sample sketch in the examples menu, upload it according to your needs, and please note that we will use Newline and a baudrate of 9600 in this section . 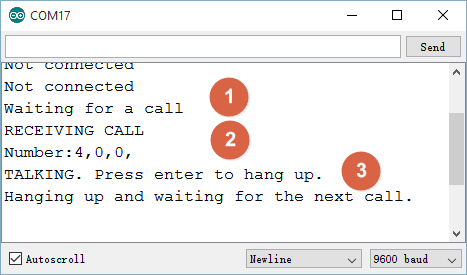 You can send a Newline character to hang up, i.e. If you close the serial monitor and open it again, you will not see any information in the window but it will still be waiting for you to input a number to call. This is because the code runs the setup() only once. Make sure you have prepared everything ready to go, i.e. the NET led is flashing properly, please check the chapter above. 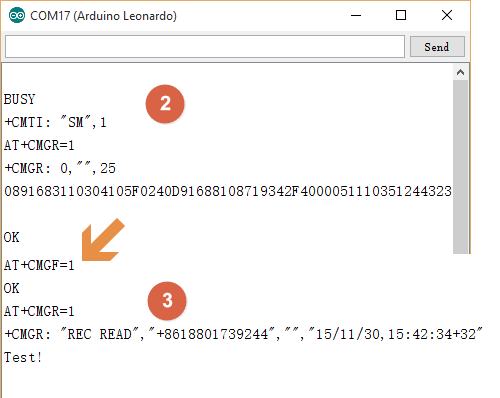 The first time you open the serial monitor after uploading the sketch, the SIM808 module would reboot automatically whether the previous NET state is ON or OFF, and after about 1 minute, the Not connected message will disappear. If not, you can press BOOT button on board to BOOT it manually. The GPS feature should be used outside, here we used it just for an explanation of the library. Q1 I noticed that on the mainboard, you designed the antenna for the bluetooth2.0. But I didn't find any description about it, is it available, if so how to use it? It is very useful to me! A Welcome! It is designed for BT feature of SIM800 module as you said. 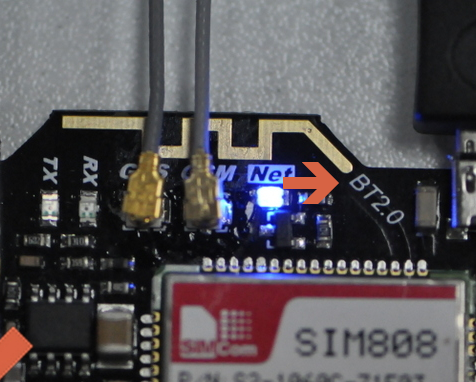 However, the newest chip SIM800 is not stable when using BT, the firmware would become defective or even lost. So it is not available on this module so far. If you need use bluetooth, we suggest to buy BT module or better BLE module, Bluno is one of the popular BLE cards, you can have a look. Shopping online from SIM808 with Leonardo mainboard SKU DFR0355 or DFRobot Distributor.